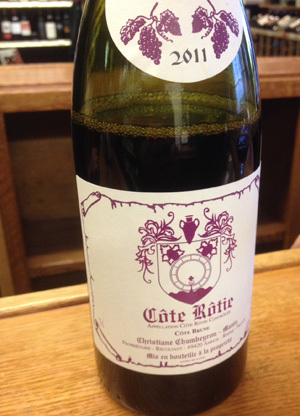 2011 Christiane Chambeyron-Manin, Cote-Rotie, Cote Brune, Rhone Red, France. This is a stunningly beautiful example of Cote-Rotie with life and vigor showing wonderful detail and full stem inclusion aromatics and spiciness in a lighter medium bodied style. I’d never had Christiane’s wines before, so this was a thrill to taste and discover, this Cote Brune, a lovely and very pretty wine gives the grace and harmony of the region and terroir in great focus with floral notes, flinty/pepper and subtle earthiness along with black and blue fruits. This Syrah is fermented old school, whole cluster with the stems and unlike many of her fancy neighbors comes in at a native yeast lower alcohol, at 12.5% which adds to the delicacy and vitality of Champbeyron-Manin’s Cote-Rotie. This vibrant and elegant wine has nice acidity and enjoys a long finish, it gives everything you’d expect and a bit more, starting with violets, smoky shale mineral notes, mixed olives, anise and peppercorns leading to a palate of boysenberry, plum, black cherry and wild currant fruits, all spice, cedar and a hint of meat and iron. It’s the total of these expressions and pure terroir clarity that gives the feeling of joy and complexity, this is a thoughtful and alluring effort to cherish over the next 3 to 5 years and maybe longer, this was impressive stuff that should fill out still and gain with another year or two in bottle, best from 2017 to 2020.